tSáile ar an nDomhnach 19/11/17 i gCionn tSáile ag a 1 a chlog. Is ócáid mór é seo do phobal Chionn tSáile agus guíonn gach éinne i nGaelscoil Chionn tSáile gach rath orthu. Beidh lá gorm agus bán againn amárach (Dé hAoine ) 17/11/17 chun ár dtacaíocht a thaispeáint dóibh. 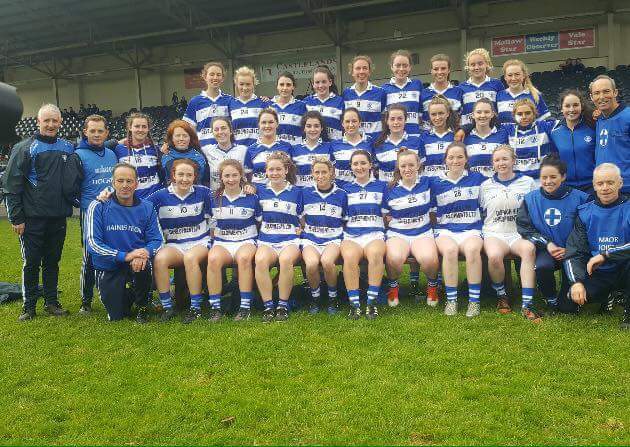 Kinsale Ladies football team are in the All Ireland semi final this Sunday 19/11/17 in Kinsale at 1pm. This is a big event for the town of Kinsale and the community. Best of luck to Kinsale ladies football from all at Gaelscoil Chionn tSáile. We are having a blue and white clothes day tomorrow at school 17/11/17 to show our support. Go n-éirí an t-ádh leo!